After the disastrous events in Joseph Knox's debut, Sirens, Detective Constable Aiden Waits is banished to the night shift with the partner no one wants, DI Peter "Sutty" Sutcliffe. Permanent night duty is the mark of no life or no career, and Waits has managed to blow up both. Then he comes across the Smiling Man. An historic hotel, the Palace is closed for "renovations" (i.e., the acrimonious divorce of its owners) when an alarm is triggered. Waits and Sutty arrive to find the night watchman face down in a hallway. Behind the wide-open door of room 413, Waits spies a body in a chair, the muscles of its dead mouth "contracted viciously, and locked into a wide, wincing grin." As the detectives spin down the rabbit hole of the unidentified man, new characters swarm around at a furious pace. The plot is thickened through flashbacks to a young boy abused as a crime tool by a Fagin-esque father figure. Knox never lets up, taking left turns just when the clues seems to jibe. Despite the chaos, he's always in firm control of each ball in the air, as if the precarious nature of their flight is merely an illusion. The setting of gritty London is wonderfully on display (sounds emanate from a heat wave like the "slow-drip of people losing their minds"). 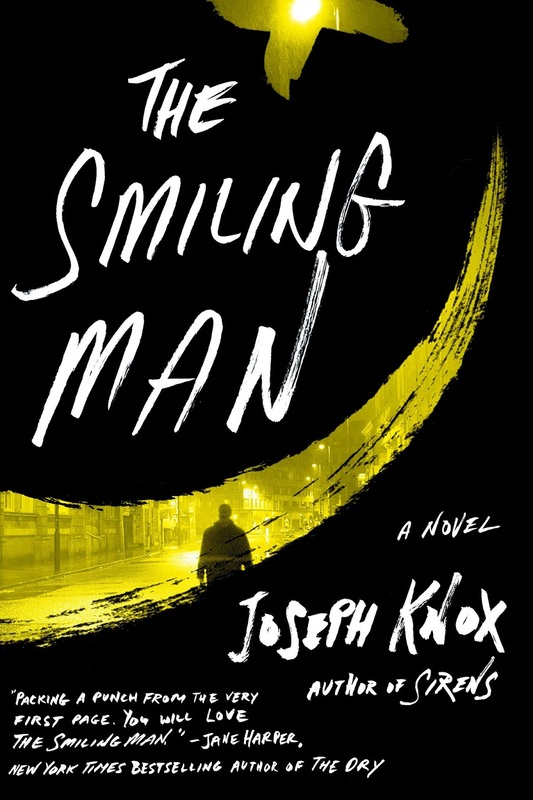 Knox's vivid descriptions ("He was a wiry, fatalistic spider of a man who played chess with the people around him") make The Smiling Man a noirish pleasure. STREET SENSE: Knox's take on the the disgraced cop brings enough to the table to make this more than just another disgraced cop story. I have not read Sirens, but the way Knox dealt with the prior installment felt Baby Bear just right. It made me want to go back and read Sirens rather than confusing or irritating me (and we know how easy that is). Knox's writing is pleasantly gritty and sometimes even more pleasantly snarky. It's also not the normal noirish "lean," but the style worked and I enjoyed Knox's descriptions enough that I often read them multiple times. A FAVORITE PASSAGE: The heat that year was annihilating. The endless, fever dream days passed slowly, and afterwards you wondered if they'd even been real. Beneath the hum of air conditioners, the chink of ice in glasses, you could almost hear it. The slow-drip of people losing their minds. COVER NERD SAYS: I find this cover super clever, but admit I missed the point at first. 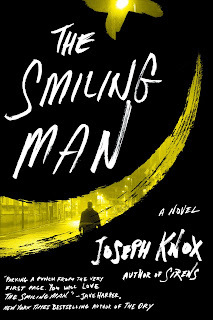 Why not include the entire (or at least more of the) "x" as the "dead" eye of the smiling man? An effort to be obtuse? Maybe I'm the only dimwit who didn't see the "x" as that symbol at first, but once I did I liked the cover better (and thought "What, did some poor sap just stick the mock-up a bit too far into the paper cutter?" 'Cause I've been there, man, and it's a drag). My only other "complaint" about the cover is it's too busy. First, blurbs have become way too important (IMHO). Second, when it clutters your cover, put it somewhere else. Or don't make the description of the blurber almost as long as the blurb. This would have been a much stronger cover if it lost the blurb and the image dropped enough to show a little more of that eye. It feels way too bottom-heavy. Interestingly, my ARC has a different and much shorter blurb and does show more of the eye, so maybe it's just the cover image I pulled for this review that's f'd up and this entire rant has been about nothing. Wouldn't be the first time for that, either.